Red eared slider turtles can be great pets but you have to know what you are getting into before making this big of a commitment. Those cute little turtle hatchlings you see for sale will grow into large, long-lived, and somewhat messy aquatic turtles. Be prepared for how much space and cleaning they will need. 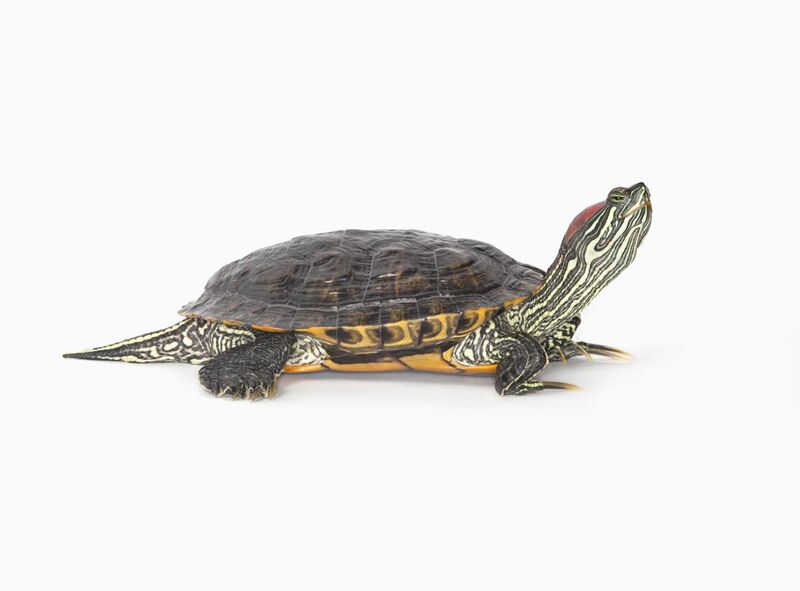 Red eared slider turtles are active pets that enjoy swimming and diving. Captive-born red-eared sliders tend to be friendlier and more outgoing than those born in the wild. In fact, wild turtles are likely to disappear into their shells or underwater when they hear or see anything approaching, while captive bred sliders may actually swim up to you expecting a treat. While it's possible to find a red-eared slider that's eager to interact with you when you pick it up, it's more likely that your pet will feel nervous and either disappear into its shell or nip. In general, therefore, it's best to just watch your turtle rather than trying to physically play with it. No matter what a sales associate tells you, your hatchling turtle will not thrive in a small plastic container. Get an aquarium, even for the smallest of hatchlings. Start with a 10-gallon tank if you must (though a 20 gallon tank is better) but be aware that your turtle will grow and need a larger tank pretty quickly. In addition, you will need to provide full spectrum UV lighting, a basking heat light, and a dry docking area. Setting up appropriate housing for a red eared slider turtle is not cheap so be prepared to spend a couple of hundred dollars on a proper set-up. Like all turtles, red eared sliders can be pretty messy since they both eat and produce waste matter in their aquatic home. Plan on having a filter that is rated for two to three times the amount of water you have in your tank so that you can keep your water clean (this is why it is harder to keep smaller enclosures clean). Canister filters and submersible filters are both used for aquatic turtles. If you don't have a filter, you will need to do weekly partial water changes and testing, something that is time consuming and messy. In addition to having proper filtration, feeding red eared slider turtles in a container of water outside their tank can also help keep the water clean. If you allow the water to stay dirty your turtle can develop ear infections, abscesses, shell rot, and other problems. Some red eared slider turtles can live year-round in an ​outdoor pond if you live in a warm climate. If you do not live in a year-round warm climate, your turtle must either live entirely indoors or be brought inside when it gets cold out. But even outdoor ponds need to be large and are not without their own problems. Providing filtration and protecting your turtle from predators, cold spells, and pesticides must all be taken into consideration as well. Red-eared sliders eat both meat and vegetables, which means they can enjoy leafy greens, dried shrimp, superworms, krill, or crickets. It's also just fine to feed your turtle a commercial brand of turtle food, most of which are specifically formulated for full nutrition. There is no need to provide additional water. It has been known for years that reptiles such as turtles (as well as many other animals like hedgehogs) can carry Salmonella and other bacteria. This shouldn't necessarily stop you from getting a turtle (unless perhaps you have very small children or immunocompromised family members in your household), but you should be aware of the risks and take proper hygiene measures to prevent infections. Incidentally, the sale of turtles less than four inches long is prohibited in the United States due to the risk of Salmonella infections from children placing small turtles in their mouths. Turtles' health can suffer if they are not warm enough, so it's important to provide an environment between 75 and 80 degrees Fahrenheit. Use a water thermometer to keep an eye on water temperature; if it falls too low, add a basking light or other heating device. Red eared sliders are easily available at pet stores. When choosing a pet, be sure their carapace (shell) is at least four inches long, and check to be sure your potential pet is active, fungus-free, and has a good appetite. Be sure to check the environment in which turtles are kept at the pet store: if the water isn't clean or the temperature is too cool, there's a chance the turtles will have health issues. 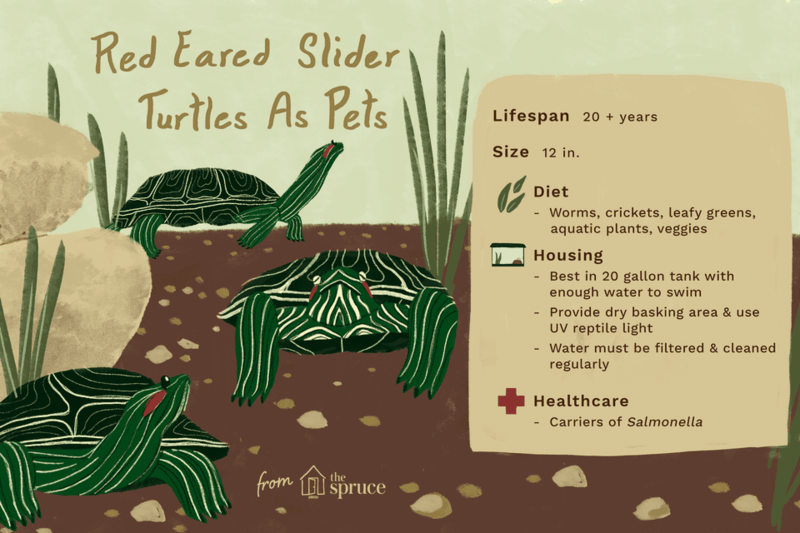 A well-cared-for, captive red eared slider turtle can be expected to live over 20 years, with some even reaching 30, 40, or 50 years old. Unfortunately, this is a lot longer than most hatchlings live due to the inappropriate care they receive. Most people don't expect that they are getting such a long-lived pet when they purchase a tiny water turtle, so if you decide to get a turtle, remember that you are making a commitment to care for that turtle over its entire lifespan. Releasing an unwanted, store bought red eared slider turtle into the wild is illegal in most places and can be harmful to the turtle as well as the environment. Otherwise, check out other types of reptiles and amphibians that can be your new pet.